It was really stinking cold. 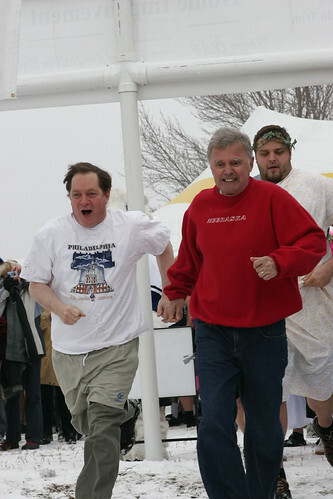 The folks at Ameritas—I went in with their team since my sister works there—have posted a nice batch of photos from the event, including the above pic of Mayor Chris Beutler. The Journal Star has a story this morning that takes a look at what businesses are calling the 2% occupation tax that will help pay for the arena. The answers they found were pretty boring: “restaurant tax”; “arena tax”; “occupation tax”. Have any of you found a business that lists the tax with a not-so-favorable name in a subtle and passive-aggressive stab at the tax? I’ve checked my receipts, but so far I haven’t seen any examples of creatively annoyed businesses. So far folks have pledged $307.69 to support Special Olympics of Nebraska. Thank you! That leaves us only $92.31 short of $400.00, which would be a fantastic number to hit. Please donate now, and in exchange I will jump in to Holmes Lake tomorrow morning. (Note that tomorrow’s forecast calls for a high of 34 degrees.) Whether you want to give $5 or $50 or $5,000, every dollar helps support the fine folks at Special Olympics. By the way, I will be jumping in with the team from Ameritas, my sister’s employer. I think we are scheduled to be one of the first groups to go in, so look for us around 11:00am or so. Come on out and cheer (egg?) us on! Confession time: How many of you drivers slid into something yesterday, or perhaps got yourself stuck? It took the Missus about two and a half hours to go get our oldest boy from school yesterday. He had stayed late to participate in a reading club. The Missus left our house (48th and Highway 2) just after 3:30pm; they returned home from Huntington Elementary just after 6:00pm. Yowza! As for my question above, I (sort of) have to raise my hand. One of our cars spent the night in a parking lot because we just couldn’t get it out. Apparently I parked on top of a sheet of ice that had been buried by the snow. Oops. On the plus side, the snow wasn’t of the big, heavy, wet variety. In fact, it was downright easy to shovel. That’s something, right? Pacific got his name after a contest won by Theresa Honeycutt of Seward. You know how some kids are terrified of this sort of mascot? I can tell you right now that although Pacific will be popular with two-thirds of my kids, one will consider him the stuff of nightmares. That should make for some interesting trips to the zoo this summer. Speaking of penguins, have any of you read Mr. Popper’s Penguins? Our classroom used that book as the basis for our costumes for the Calvert Book Parade back in second grade with Ms. Cramer. Good times. horse processing plants in Nebraska. And that has people aghast. What’s the big deal with horse meat anyway? That’s an honest question. I don’t get all the fuss. A hunk of animal carcass is a hunk of animal carcass. Why all the fretting about this particular kind of flesh? I put my energy into caring about what happens to an animal while it’s alive. If you want to talk about living conditions or species preservation or methods of slaughter, I’m your man. What happens to the body after death generally doesn’t interest me. It is, after all, just a body. I would much rather the body be put to some use than no use. Is it just the familiarity factor that drives horse meat antipathy? I can understand that, I suppose, although it doesn’t justify making the product illegal. What else makes horse meat so offensive? And as long as we’re talking about horse meat I may as well ask: Have any of you ever had horse meat? I’ve never had the opportunity myself. I would try it if it were available. I’ll try most anything once. Four years ago I plunged into a frigid Holmes Lake on behalf of Special Olympics Nebraska. You folks generously gave $375.00 to the cause. Ever since then I’ve been talking about how I want to do it again. Well, no more procrastinating. I’ve signed up with my sister’s team from Ameritas and, this Saturday, February 26, I’m going back in. I need help from you folks. This is, after all, a fundraiser. Please donate to Special Olympics Nebraska via my fundraising page. It’s a quick and simple process, and you get to support an awesome organization. Together, let’s see if we can beat last time’s total of $375.00. Thank you for your support! Donate now. I want to call out YMCA of Lincoln for being awesome. I could list a hundred anecdotes that prove the local Y’s awesomeness, but I don’t have the time and you probably don’t have the patience. 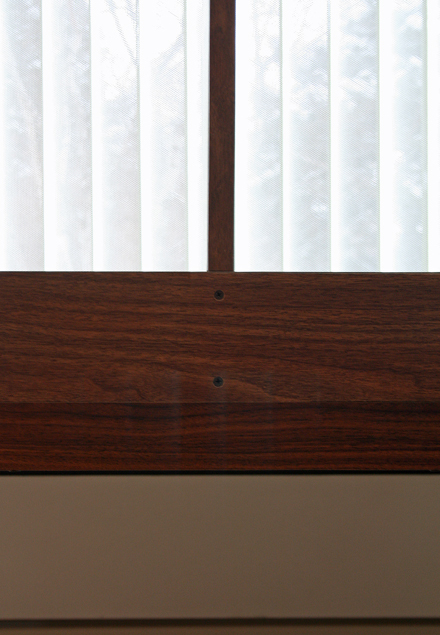 Instead I’ll focus on three bits of nifty that have made us really appreciate the Y. The first is the Y’s child watch. Robbie has been a regular at the Cooper branch child watch since he was an infant. He has always been well cared for and he has met countless friends of all ages. Now that we are foster parents, our foster kids are welcomed as well. The boys love it. Next up are the Y’s “fun days”. Available on weekdays when LPS is not in session, fun days have been a real lifesaver for us. They play, do crafts, go on field trips, swim, and do all kinds of fun activities. Our oldest foster child has a blast. He is there right now, in fact. No doubt he will return home and tell me all kinds of stories that make me wish I were 8 again. Last but not least are the people. I know every organization has its share of great people, but the Y is particularly blessed. I have two examples. The Y is offering various summer programs. We wanted to get our oldest into some of the programs, but we needed to figure out some funding questions first. By the time we did that there were only slots available in a couple weeks during the summer. Drat! No worries, though. A wonderfully helpful lady—I’m sorry I don’t know her name!—called around to other summer programs in town on our behalf, reserved a spot for our foster son, and began the process of transferring funds to the other program. How’s that for customer service? And then there is Howard. Howard is a custodian at the Cooper branch. Robbie loves Howard and Howard loves Robbie. They look forward to seeing each other every morning. They exchange gifts, tell tales, and just have a wonderful relationship. I have never met Howard, but via Robbie I know all about him. Robbie’s relationship with Howard is a wonderful example of the power of intergenerational friendships. I could go on, of course, but I promised to be brief. We as a family have come to appreciate the Lincoln Y for all kinds of reasons. How has the Y affected you and/or your family? I was all excited this morning when I saw a property listing for Catalyst One. I thought: This is it! It finally feels real! After all these years and all the false starts it’s not difficult to understand why a pro-Lincoln guy like me might be a little excited. Then I noticed the project’s status: “Proposed”. Blah. I was really hoping for something more along the lines of “Sure Thing; Pinkie Swear”. Oh well. It won’t really feel real until we play Four Square on the roof. I wonder who we talk to about making that happen? 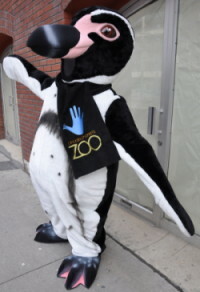 The Children’s Museum is holding ZooZeum Day tomorrow from 10am until 1pm. It’s all the usual Children’s Museum goodness, plus all sorts of animals and animal-related activities. The Nebraska Robotics Expo is all day tomorrow at the SAC Museum. I really hope at least one of my kids gets into something like this one day. The Great Backyard Bird Count Activity Day is tomorrow morning from 9am to 11:30am at the Nature Center at Pioneers Park. My kids have been begging to go to the Nature Center, so this may be where we end up ... weather permitting. The LJS rundown includes even more activities, but these are the three we’ve had our eyes on. Or if none of these suggestions revs your engine, there’s always spring cleaning around the house. For those of you concerned about what the arena will look like, February 25 is your day. That’s the day architectural renderings will be delivered to the JPA. So far we’ve been looking at renderings like these, but they have been tentative. The real deal comes next week. Personally I’m not opposed to the current look, although I know many folks think it’s horrid. My only concern with it is expansion—can you expand something like that in a manner that’s architecturally consistent? Some of you are probably hoping for a particular look. What do you have in mind? On the “we need to get this thing built” side is Tammy Buffington; on the “I’d love to build it; show me the money” side is Mayor Chris Beutler. Neither one has a good plan for getting it done. Ms. Buffington, for example, hilariously proposed using “budget efficiencies” to fund the project. Lincoln’s budget is nowhere near large enough that a snip snip here and a snip snip there will uncover enough money to pay for something as huge as the South Beltway. Especially after years of cutting to the bone. There’s just not much, if any, fat left in the City budget. Nor would not building the arena have helped, as Ms. Buffington suggested. That is, unless Ms. Buffington would have redirected all the taxes directly to the Beltway. That’s possible, but she doesn’t strike me as the tax increase type. I could be wrong. Personally, I could really dig a tax to pay for the South Beltway. Of Antelope Valley, the arena, and the South Beltway, the latter is by far the most important to Lincoln’s future. The never-talked-about East Beltway is right up there, too. But I digress. If yesterday’s debate is any indication, it looks like the mayoral race is going to be lively. That could be a good thing—lively political races force candidates to address difficult topics. On the other hand, sometimes lively means dirty. That’s not something we need right now. Here’s hoping the two candidates can stick to the issues that matter to Lincoln.